This article will help you set up audio files for your assessment for all your students or for your IEP-Secion 504 audio accommodation students. Adding audio to your assessment allows students to play the audio when taking the assessment using our online testing platform, the ALL In Learning Student Portal, or our iOS app for iPads, Engage & Learn. You can set the audio to play throughout the entire assessment, or you can set individual audio files to play for individual slides only. Read below for more detail on these choices. You can create any type of assessment you would like, with a mixture of slides and types of questions, or you can import PowerPoint and Word files and turn the slides into questions. 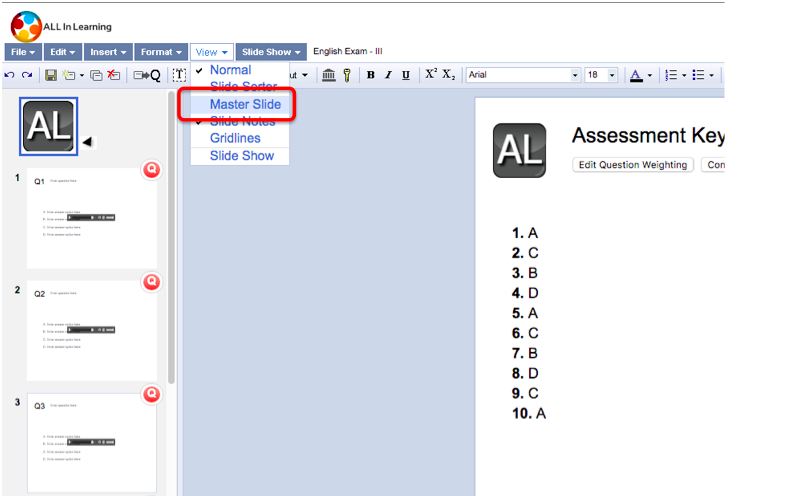 Review our articles on how to create Custom Lessons or how to use our Quick Key assessment creator. Will you need audio for the entire assessment, or just for a few questions? Do all the students need to listen to the assessment, or just certain students with specific education plans? Answering these questions now will help you determine how best to set up the audio for your assessment! Third, use a recording program for your assessment and save your recording to your computer as an audio file. You have two options for adding the audio file to your assessment, and your choice will determine the kind of audio file you should create. One option is to record an audio file for the whole assessment. This file will play throughout the assessment, no matter what slide is active. The student will be able to pause and start the assessment, from the last paused position or from the beginning, at any time. An example of using this option would be to record the entire assessment in one file, from beginning to end, beginning and pausing as you read the questions and answer choices. The other option is to record individual audio files for each individual slide. When the student clicks on a new slide, they will be able to play, pause and restart the audio file for that slide only. An example of using this option would be to record each question and answer in separate audio files, and then upload them individually for each slide. Almost all computers come with a simple recording program that you can use. Contact your school's IT department for recommendations if you are unfamiliar with audio programs. The audio recording must be saved as an mp3 or an ogg file. Fourth, if you would only like specific students with read-aloud or audio accommodations to have the option to play the audio file, make sure they have the necessary demographic tag. 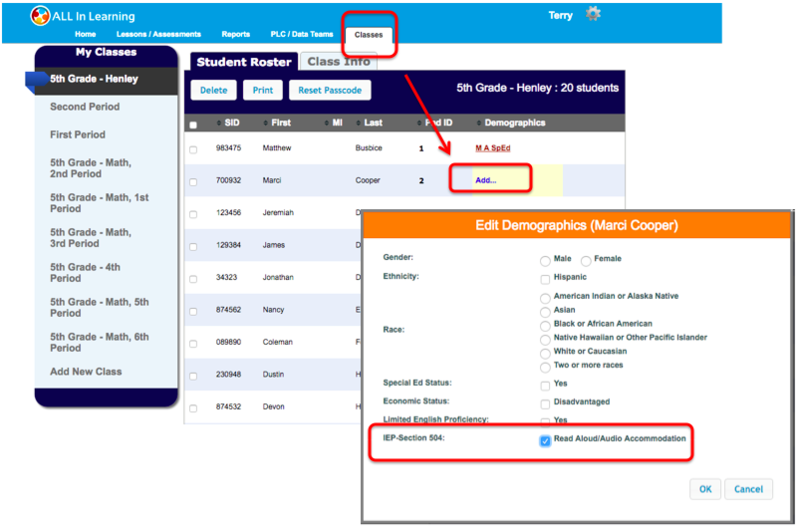 To add or change this for your students, click on your Classes tab, select the class, and then for the student, click on the Demographics link. From here you can change all the student’s demographic information, including their IEP-Section 504 audio accommodation. 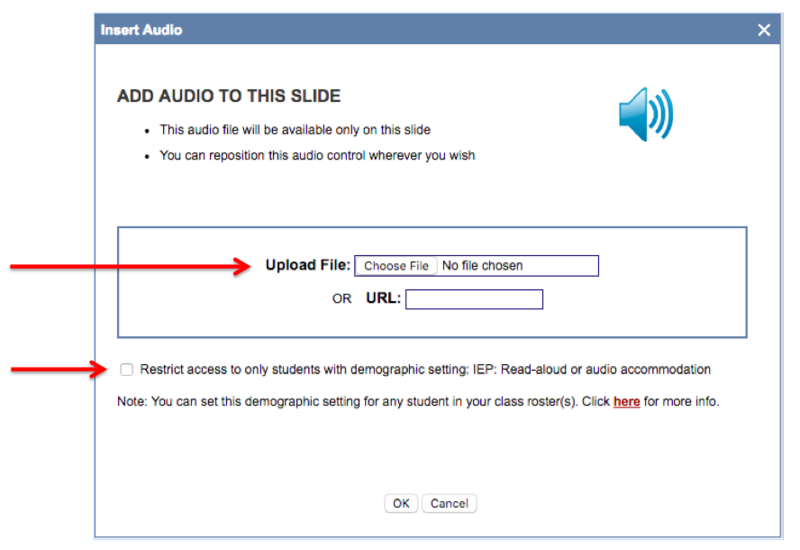 Fifth, add your audio file to the whole assessment or an audio file to each individual slide. If you choose to add the audio to the whole assessment, the audio recording will be paused and started while the student moves through all the questions. The student will have access to the entire recording throughout the assessment. 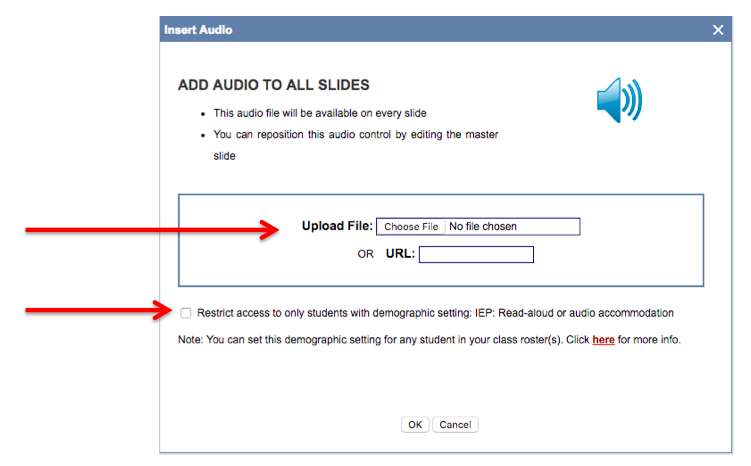 If you choose individual audio files for individual slides, the student will have access to the specific audio file only when on that slide. You cannot do both. Click on the main assessment block. This will show you the list of questions and answers and the points assigned to each of them. Upload your audio file as instructed. You also have the option to enter a URL address, and it is here that you can choose to restrict the audio option to your IEP-Section 504 students. The user will be directed to the “Master Slide” where you can delete the audio file by clearing the audio command box, or you can move the audio box to another part of the slide. Please note that while you can move the audio box around the slide, and this might be helpful for editing your assessment, the audio command when displayed for the student will be at the bottom of the slide, and it will not interfere with the slide or question and answer content. It is now possible to play this audio file throughout the assessment, and you can hit the save icon and exit, or you can click on a slide to edit the assessment, or continue to add and delete questions. It is now possible to play this audio file on this slide! Need to delete the audio file? If you need to delete an audio file and it was uploaded for the whole assessment, you’ll need to delete it from the Master Slide. Click on View from the menu options, and then click on Master Slide. From here you can move the audio box to a different part of the slide if needed, or highlight the audio box and then click on Edit and Clear. If you need to delete an audio file and it was uploaded to a specific slide, click on the individual slide, then highlight the audio box, click on Edit from the menu options, then on Clear. Finally, assign your students the assessment! For your students to use the audio file, you will need to assign the assessment using our Student Portal - so students can take the assessment online - or our Engage & Learn app for student using iPads. Follow the links for more information on these options.